All proceeds of the fundraiser benefit the Friends of Dreamland non-profit restoration of Taborian Hall and the Dreamland Ballroom which is a nationally recognized historic site. 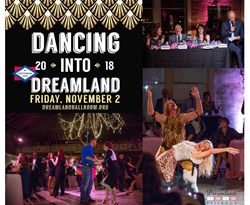 Friday, November 2nd the Friends of Dreamland non-profit will host the 9th Annual Dancing into Dreamland dance competition and fundraiser. The event will be held at 800 West 9th Street (headquarters of FlagandBanner.com) in downtown Little Rock. Festivities begin at 7 p.m. and the dance competition starts at 8 p.m. Alice 107.7’s Poolboy and THV11 anchor Raven Richard will emcee the evening. Nine dance teams will compete in a variety of dance styles. Winners will be selected by the three competition judges and will receive a cash prize. Judges this year are David Miller host of Swingin’ Down the Lane on KUAR, Amy Kelley Bell, co-owner of South on Main, and Christen Burke Pitts, a 28 year veteran dance instructor and founder of the Theatre Dance Program and Dance Troupe at North Little Rock High School. The People’s Choice Award is given to the dancers that receive the highest number of text votes from the audience. The event also features a silent auction, an art exhibit, heavy hors d’oeuvres, refreshments and a donation bar. After the competition, the dance floor will be open to all attendees for continued celebration. All proceeds of the fundraiser benefit the Friends of Dreamland non-profit restoration of Taborian Hall and the Dreamland Ballroom which is a nationally recognized historic site. The Taborian Hall is more than 100 years old and a major site for African American history in Little Rock. The Dreamland Ballroom played host in the early twentieth century to legendary performers of the Chitlin’ Circuit including Duke Ellington, Ella Fitzgerald, Louis Armstrong and many more while the Taborian Hall itself was home to African American owned businesses during a time of segregation in the south. In 2018, the Friends of Dreamland were awarded a $499,000 grant from the National Park Service for an elevator to make the Ballroom located on the 3rd floor handicap accessible. Renovations are scheduled for 2019. Tickets are still available for $75 ($25 for students with student ID) and can be purchased online at http://www.dreamlandballroom.org or at the door the night of the event. A limited number of party tables may still be available, please contact Matthew McCoy at 501-255-5700 for details.